Trista Reynolds, the mother of the child who was reported missing in 2011, appears with her family to confront Ayla's father and grandmother. 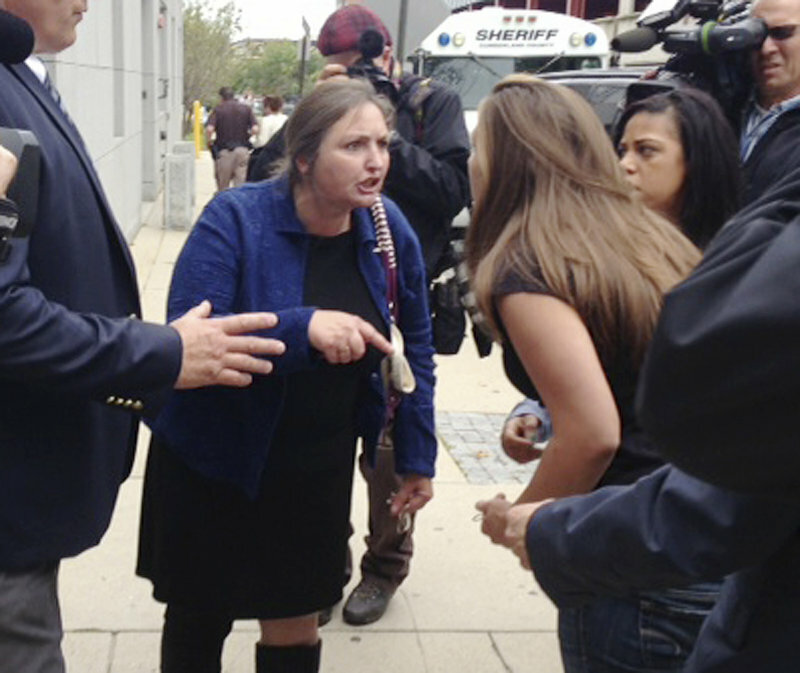 PORTLAND — A courtroom confrontation Wednesday between relatives of a toddler from Waterville who disappeared nearly two years ago ended with both sides being escorted from the Cumberland County Courthouse, then spilled onto the streets. Trista Reynolds, whose daughter Ayla Reynolds was 20 months old when the girl’s father reported her missing on Dec. 17, 2011, went to the courthouse with her family to confront Justin DiPietro, the father, who was in court on an unrelated charge that he shoved his ex-girlfriend Courtney Roberts. 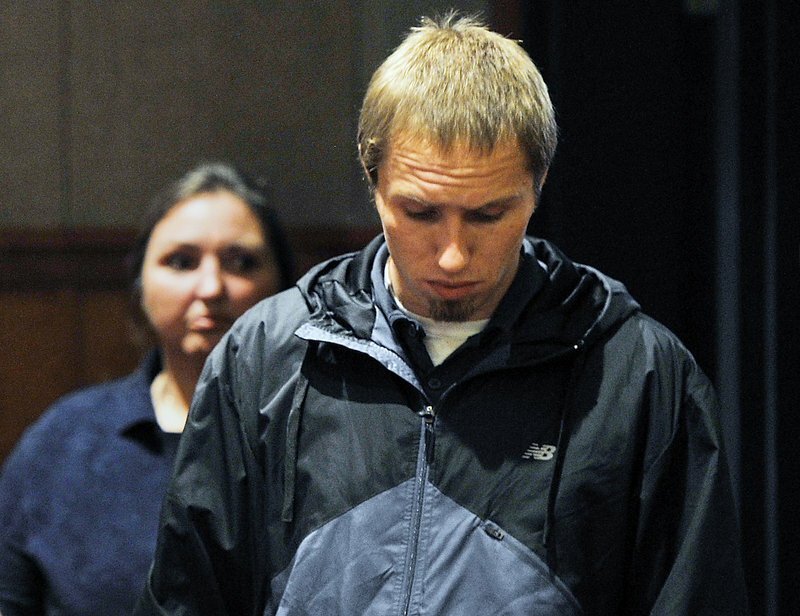 Justin DiPietro, father of Ayla Reynolds, who is missing and presumed dead, enters the the Cumberland County Courthouse on Wednesday, Sept. 25, 2013 with his mother to appear before the judge on an unrelated assault charge. The confrontation began when DiPietro’s mother, Phoebe DiPietro, called Reynolds’ father, Ron Reynolds, an obscenity in the courtroom, prompting him to follow her into a hallway, where the verbal exchange escalated, according to witnesses. Phoebe DiPietro and Ron Reynolds were escorted from the building by judicial marshals, followed shortly afterward by Trista Reynolds and other members of her family who were asked to leave. Reynolds planned a news conference to coincide with DiPietro’s court hearing, to raise awareness that no one has yet been charged in Ayla’s disappearance. It was her latest public effort in recent weeks. Earlier, she released details of the case that she said police had told her regarding blood from Ayla that was found at Phoebe DiPietro’s home in Waterville, where the girl was last seen. Reynolds said she believes that Justin DiPietro, his sister, Elisha DiPietro, and Roberts, who were at the home with Ayla when she was last seen, should be prosecuted, although she acknowledged that charging them in Ayla’s death isn’t possible without her daughter’s body. DiPietro pleaded guilty at Wednesday’s hearing to violating conditions of release related to a traffic stop Sept. 6 in which police found alcohol in his vehicle. He was sentenced to four days in jail, which he has already served, and ordered to pay a $150 fine. DiPietro also faced a charge of assault related to the incident in July with Roberts, but that charge was dropped Wednesday because Roberts had changed her story since filing a complaint. DiPietro’s hearing was unrelated to his daughter’s disappearance, but it was a public opportunity for Trista Reynolds and her supporters to confront him once more. While waiting for his court hearing, DiPietro got up at one point to leave. He made sure his route didn’t take him directly past Reynolds. Shortly after that, Phoebe DiPietro stood to leave. She walked past Trista and Ron Reynolds and quietly said something to them. DiPietro kept walking while Reynolds was restrained by security officers. “Your son killed my granddaughter,” he yelled as she walked away. Both were told not to return to the courtroom. The confrontations didn’t end there. Trista Reynolds and her father waited with their supporters outside the courthouse while Justin DiPietro’s case was resolved. Phoebe DiPietro was escorted back into the courthouse to get him and was confronted by Reynolds and her father. When Justin DiPietro and his mother came outside a few minutes later and started walking away from the courthouse, Reynolds and her father followed, shouting at them. “Tell me what you did to her,” Reynolds said.